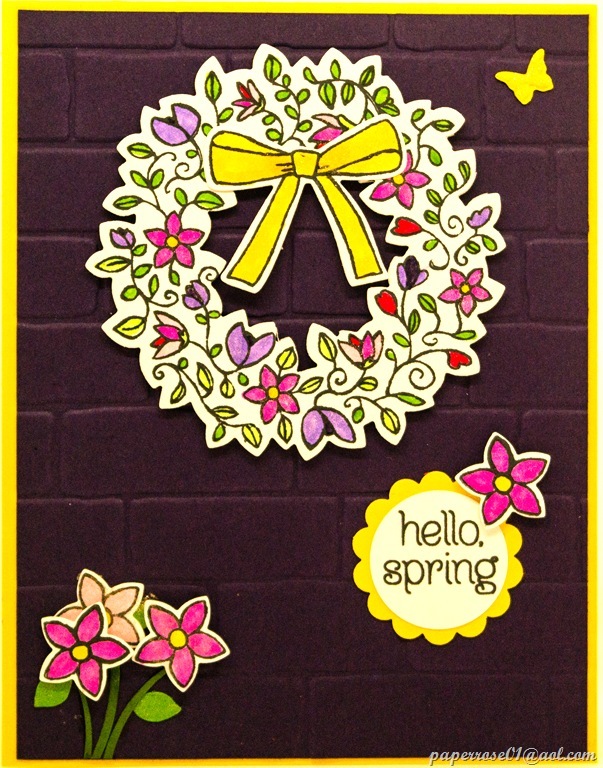 The Circle of Spring stamp set helps us create a beautiful spring wreath. 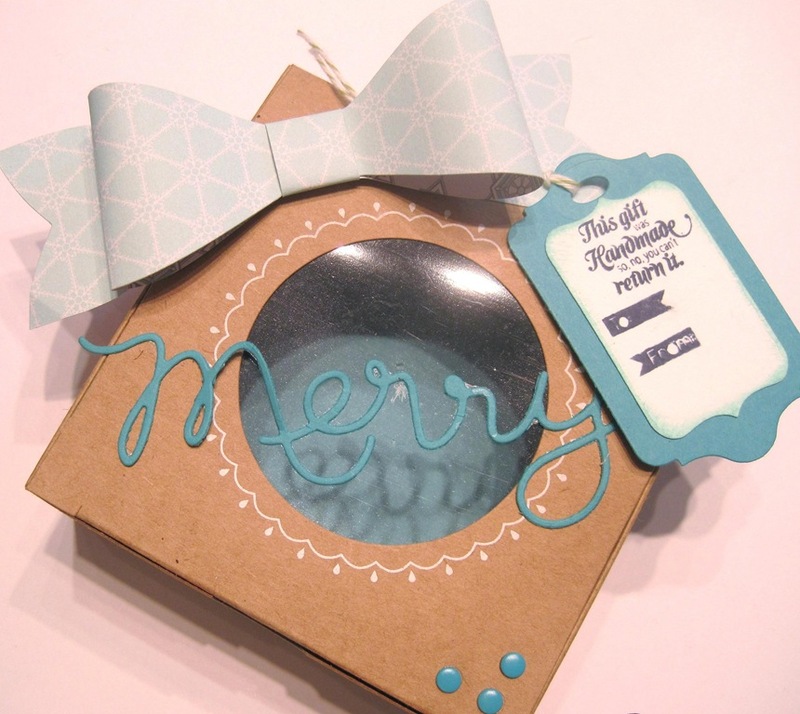 Even better is the compatibility with the Wonderful Wreath Framelits Dies – a set we used Christmas 2014. This Elegant Eggplant and Daffodil Delight card is the epitome of springtime. Although very hard to see, the wreath hangs on a brick wall. I’m sure you have never seen an eggplant brick wall, but I liked the color combination. Spectrum Noir markers are used to color the wreath, bow and flowers. Dimensionals under the wreath and flowers add the 3-D effect. Wink of Stella was used on some of the flowers, bow and butterfly. The wealth of Spectrum Noir marker colors allow you many choices. 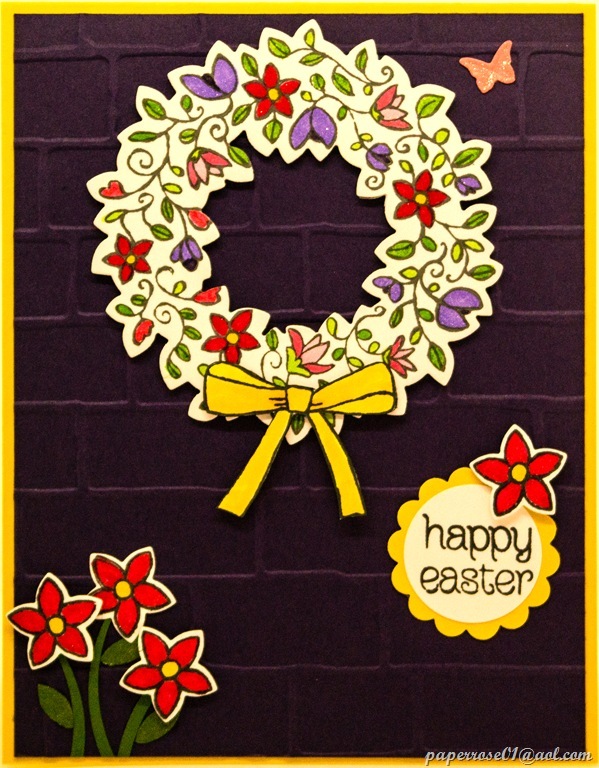 This is another version of the Circle of Spring wreath card. More red was used which gives a very bright finish. Wink of Stella was again used to provide the glittery interest. Speaking of Wink of Stella – several of you had ordered this easy to use glitter brush. When I went to place the order, I discovered this item was on backorder, and there was no anticipated delivery date. In fact, there still is no anticipated date. So I reached out to Amazon and was able to order the exact same item, packaging and all for $6.90 which includes tax. So I have 6 for sale at $6.90 each if you are interested. Wink of Stella is also available in colors. I have the pink, yellow and green which you are welcome to try. However, I only have the clear for sale. I love this product and feel it can add much to a project if used judiciously. Hope to see you at March Stamp Camp. Let me know in advance if you need a kit – available for $12.00. Don’t hesitate to contact me if you have questions or concerns. So sad! The 3 men (hubby, Andy, Larry) were asked to come up with a clever title for this blog – and this was the best they could come up with! 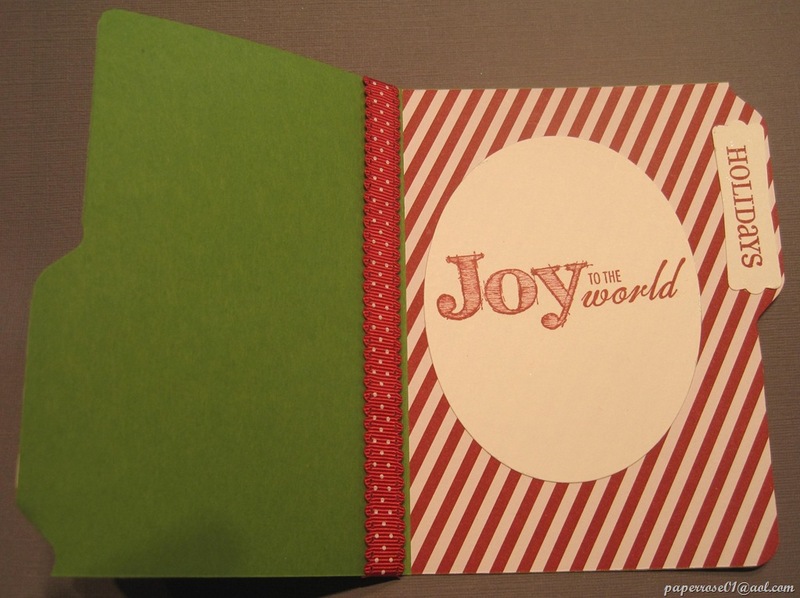 But – let’s talk holiday folders – file folders to be exact! This is the first file folder card we experimented with. – shown here in vertical format. 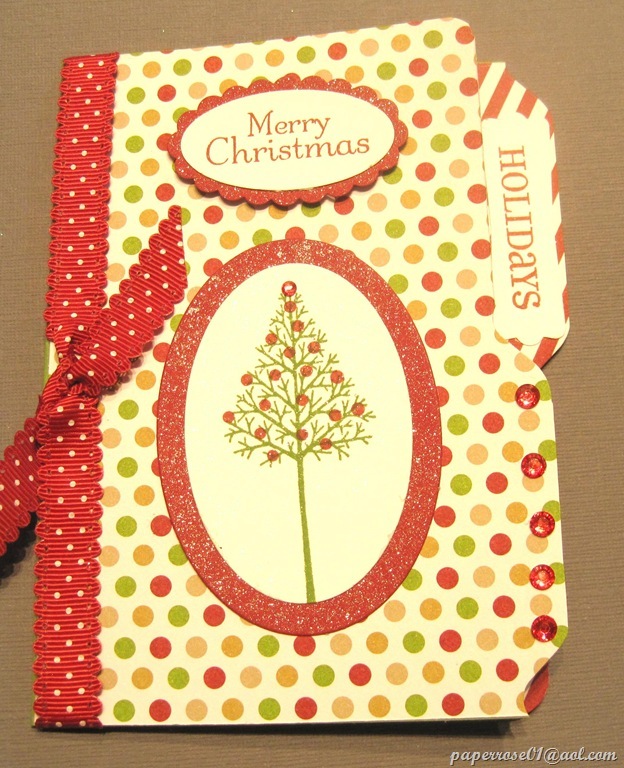 The card is created by taking card stock covered with Designer Series Paper, and ”run” thru the Envelope Punch Board to form the tabs. The hostess set “Warmth and Wonder” was used for the tree and ornaments. The Season of Style DSP Stack in Cherry Cobbler, Gumball Green, and Gold provided our color scheme. The card stock used to decorate the card was all sprayed with home brew to provide the sparkle that is so appropriate this time of year. Although not necessary, I fully lined the inside of my folder, although It is not necessary. 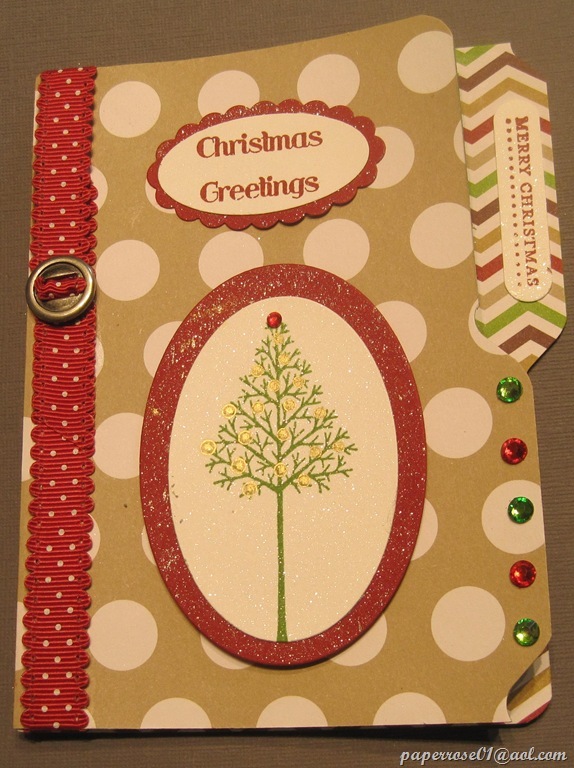 By the way, if you have an Envelope Punch Board, please bring it to November Stamp Camp. 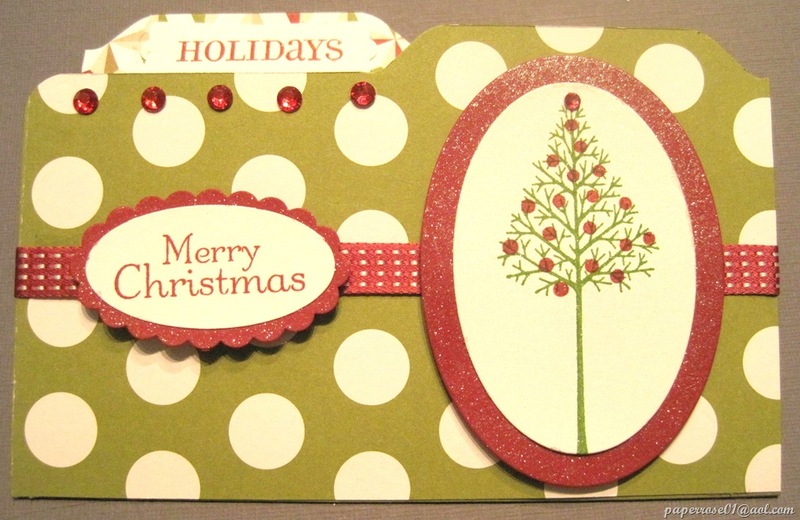 The message was stamped in Cherry Cobbler on die-cut oval card stock. Caution needs to be taken when positioning the inside message so the card stock does not appear above the file folder front. Let’s look briefly at two other file folder cards. 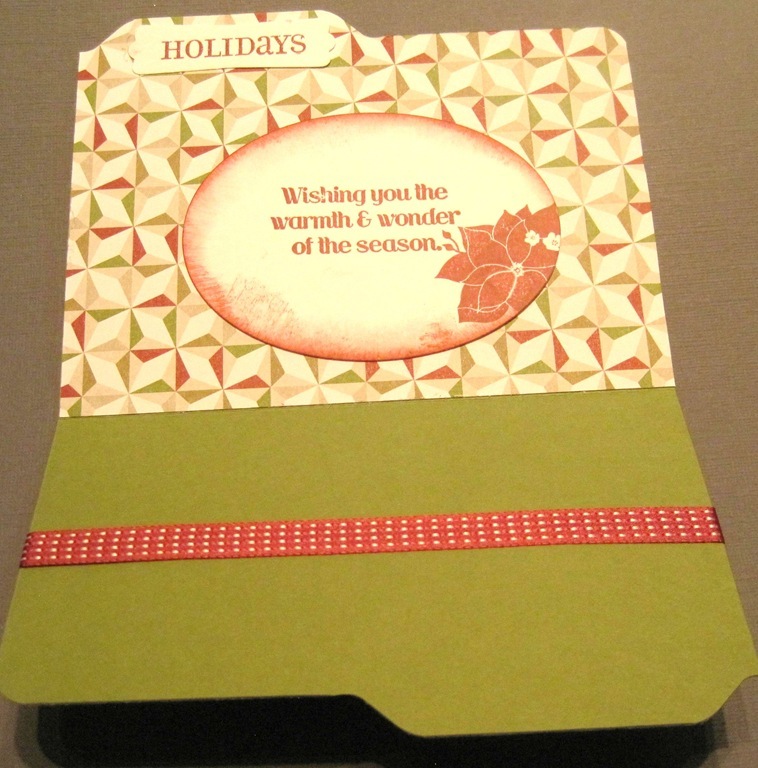 This vertical file folder card uses different DSP from the Season of Style DSP Stack. The tree was stamped with gold ornaments unlike the previous tree which was stamped with Cherry Cobbler. The process is the same as the previous card. The ribbon was used with a slider which was much easier than tying the knot used on the previous card. This is the same idea, but the card is shown in a horizontal format. A different ribbon running around the file was used. Home brew was used to provide sparkle to the paper. This is the inside of the horizontal card shown above. 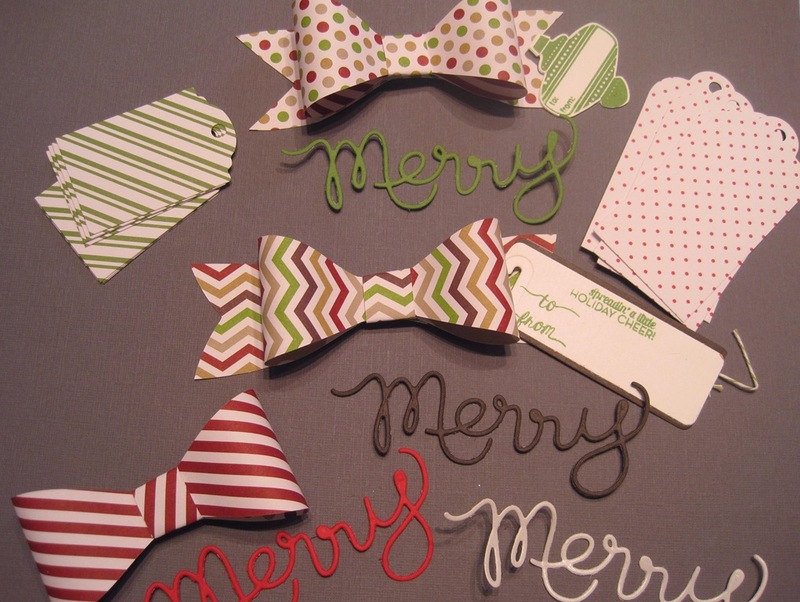 Here are some bows I made and the accompanying “merry” image made from the new Expressions Thinlits Dies. Although these may look difficult, I found that placing several layers of waxed paper between the die and the card stock, and adding a shim on top of the “sandwich” before running through the Big Shot. I found toothpicks worked fine if assistance was needed to pop the word out. “Merry, Love, Grateful” in script come in the set. 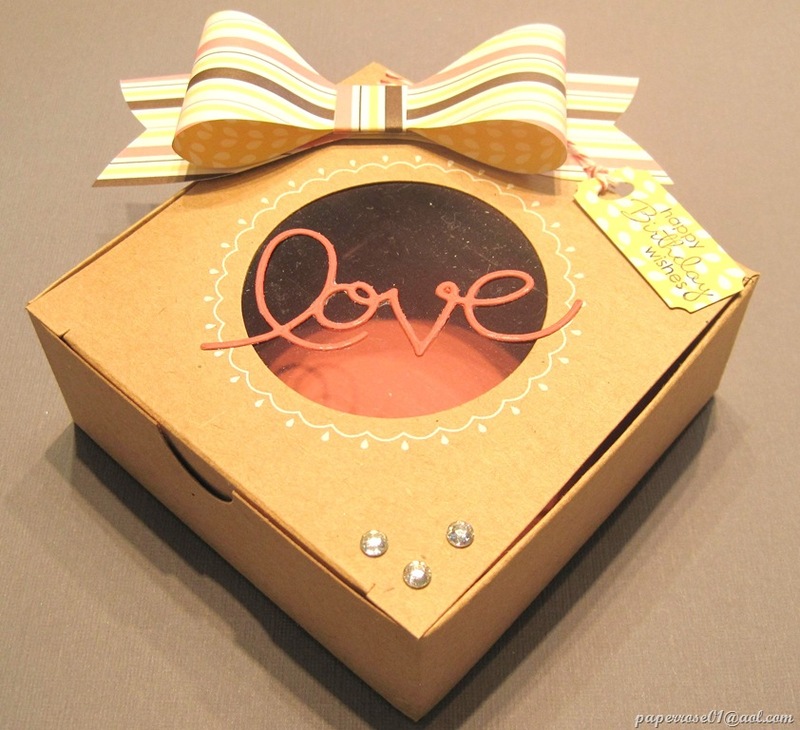 Note the 3rd box which has been done for a birthday and has “love” embellished on the box. There is one more holiday card to view. 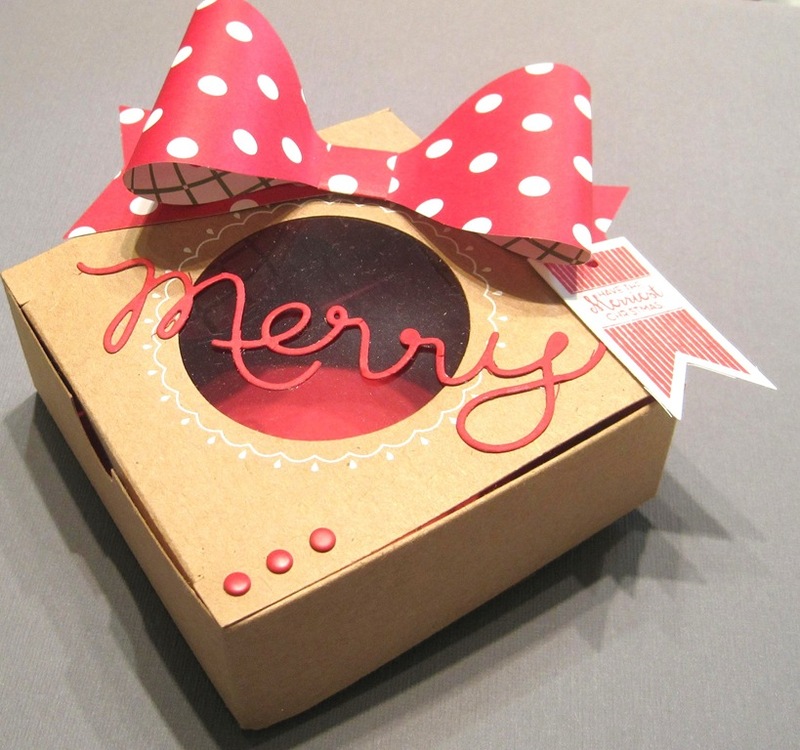 I noted in my E-mail that I would post all the Christmas projects in this blog, but I am just too tired! Check back tomorrow for the last blog for this stamp camp.